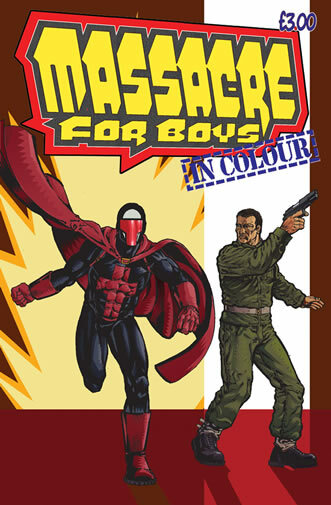 The definitive Massacre for Boys anthology and, as the name suggests, not a shred of black and white. We’ve got a brand new, zombie-related, airborne adventure for the Walking Wounded, and following that it’s superhero-a-go-go as The Crusader takes on a bad boy serial killer. Amazing supporting features include sci-fi western Badland Rules, Edwardian whimsy The Diogenes Club, animal hat-related shenanigans courtesy of Jimmy Baker, football thrills in Bosher’s Goals and yet more war action in a second Walking Wounded. By Chris Denton, Steven Denton, Bolt-01, Richmond Clements, Matthew Hunt & Paul Harrison-Davies.